Following on from the previous posting on ‘Ch’io mi scordi di te? – Non temer, amato bene K. 505’; The opera beauty Anna Nancy Storace was born in 1765 in London to an Italian father and English mother. Like many of our past musical tarts with musical fathers, Nancy’s dad wanted his children to follow in his musical footsteps and began training Nancy in singing from a young age. Nancy’s talent shone and she began performing all over and even had some royal audiences. By the age of 13 she was studying opera in Italy. By the time Nancy was eighteen she was an opera star on the Vienna stage. The Viennese loved her and Nancy loved the celebrity. Unfortunately Nancy’s good fortunes took a turn when her mother encouraged her to marry some old English musician by the name of John Abraham Fisher. The marriage was a disaster. John was cruel and would beat his poor little wife. The abuse was so bad that Nancy would be forced to cake on makeup to hide her bruises. Eventually the gossipers caught wind of the abuse and the news reached the musical Emperor Joseph II, Marie Antoinette’s brother. Well, Joe couldn’t have his prized opera singer performing Salieri’s masterpieces all black and blue! He booted Fisher out of Vienna. If only emperors always stepped in to save our tarts from awful husbands! Nancy’s husband may have been gone but she was now pregnant. Another disaster befell her when she collapsed and lost her voice for a few months. A daughter was born not long afterward but given to a foundling hospital where she later died. After the dramatic hiatus Nancy returned to the stage and back to her celebrity lifestyle. This time her celebrity lifestyle included men…a lot of men. 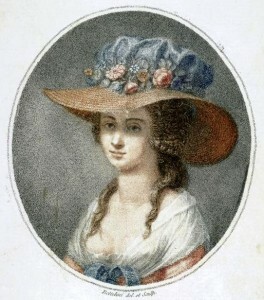 Nancy got around, dating many of the musicians in Vienna. It is even rumoured she dated Vienna’s most famous musician, the first ever rock star, Wolfgang Amadeus Mozart. Another supposed love of the loose lady was Emperor Joe. What would his mother say! Tsk tsk. Beside her romantic involvement with Mozart, Nancy also made a great effort in bringing the rocker to England to compose an opera. However, when Mozart received his royal invitation (from the Prince of Wales, can you imagine the mischief they would have got in? Mozart would never have finished an opera) Mozart was dying and would not be able to make the journey. Nancy returned back to her homeland to continue her career. It was here she began her longest and most successful relationship with fellow British opera hunk, John Braham. The two would have a son together, Spencer. The rest of Nancy’s life continued to be pretty happy. She even struck up a friendship with fellow tart, Emma Hamilton. Sadly though, her last remaining years would not be as blissful. She had a painful breakup (after eighteen years) with Braham which resulted in legal battles. Jerk. A few years afterward, in 1817, Nancy suffered from two strokes and died. For more information regarding this mistress of music you can visit her biographer’s site.